One of the Apostles, of the tribe of Levi and of the country of Cyprus. In Acts iv. 36 his name is given as "Bar Naḥamah" (son of consolation), of which "Barnabas" is the Grecized form. Some explain the name as equivalent to "Bar Nebuah" (son of exhortation), while Deissman, and recently Dalman, refer to "Barnebo" (son of Nebo). Barnabas was the elder companion of Paul in his journeys as apostle—that is, delegate commissioned to bring the charity collection to the mother-church at Jerusalem; wherefore the two together are called "apostles" (Acts xiv. 4, 14; see Apostle). He joined the early Christian community by selling his property and laying the proceeds "at the apostles' feet" (ib. iv. 37). According to Acts ix. 27, the admission of Paul as a convert to the Church was recommended by Barnabas; and when the latter was sent to Antioch as preacher of the new faith, he went to Tarsus to secure Paul as coworker. For a whole year they remained together in Antioch, establishing there the first important church of Gentiles and called by the name of "Christians" (Acts xi. 22-26). After this, Barnabas (who, as the elder of the two, is mentioned first) and Paul were sent with the collected gifts to their brethren in Jerusalem (ib. xi. 30, xii. 25), and on their return were sent forthtogether, by direction of the Holy Spirit and with laying on of hands, to do missionary work for the Church (ib. xiii. 2 et seq. ), Barnabas, as the elder and probably more dignified, being taken by the pagans as Zeus, and Paul, the eloquent speaker, as Hermes (ib. xiv. 12). It seems, however, that the radical views of Paul in regard to the Mosaic law caused dissension between the two, and, finally, their separation (see Gal. ii. 1, 9, 13), though the narrative in Acts xv. 39 refers "the contention" to the fact that they could not agree on taking Mark with them as companion. Barnabas takes Mark and sails for Cyprus; and nothing further is recorded of him. He is referred to once more, in Cor. ix. 6, as an apostle who, like Paul, supported himself by his own labor. The identification of Barnabas with Joseph Barsabas (Acts i. 23) is probably the cause of his having been counted among the seventy apostles (see Clement of Alexandria, "Stromata," ii. 20, 116; Eusebius, "Hist. Eccl." i. 12). The Judæo-Christians claimed him as one of their own, and spoke of him as having preached in Rome and Alexandria (see "Clementine Recognitions," i. 7-11; "Clementine Homilies," i. 9-14). A fifth-century legend speaks of him as having been martyred at Cyprus. To Barnabas was ascribed by Tertullian and others the authorship of the Epistle to the Hebrews; and a "gospel according to Barnabas" is mentioned among the canonical writings in the decree of Gelasius (Zahn, "Geschichte des Kanons," ii. 292). 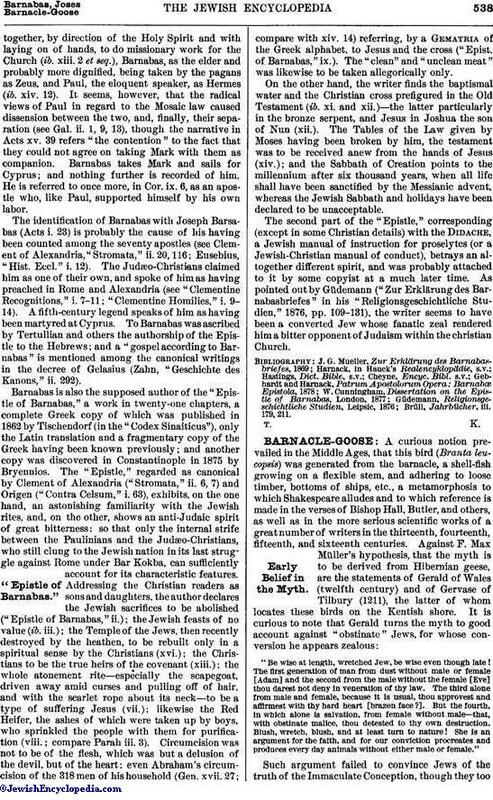 Barnabas is also the supposed author of the "Epistle of Barnabas," a work in twenty-one chapters, a complete Greek copy of which was published in 1862 by Tischendorf (in the "Codex Sinaiticus"), only the Latin translation and a fragmentary copy of the Greek having been known previously; and another copy was discovered in Constantinople in 1875 by Bryennios. The "Epistle," regarded as canonical by Clement of Alexandria ("Stromata," ii. 6, 7) and Origen ("Contra Celsum," i. 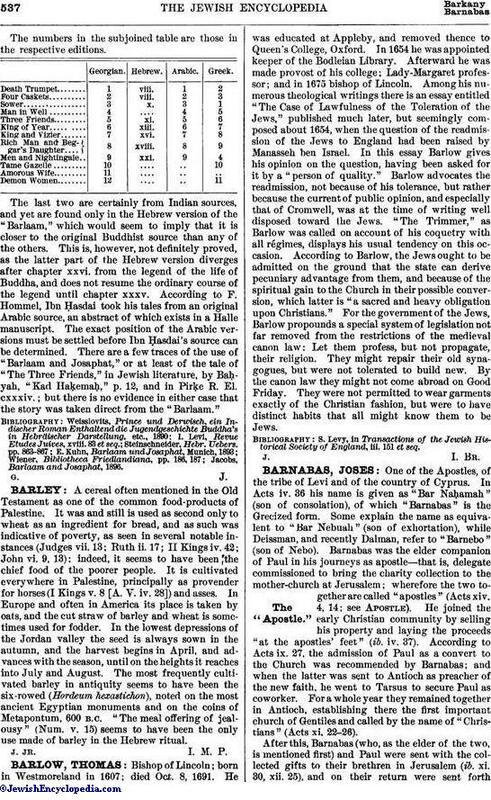 63), exhibits, on the one hand, an astonishing familiarity with the Jewish rites, and, on the other, shows an anti-Judaic spirit of great bitterness; so that only the internal strife between the Paulinians and the Judæo-Christians, who still clung to the Jewish nation in its last struggle against Rome under Bar Kokba, can sufficiently account for its characteristic features. Addressing the Christian readers as sons and daughters, the author declares the Jewish sacrifices to be abolished ("Epistle of Barnabas," ii. ); the Jewish feasts of no value (ib. iii. ); the Temple of the Jews, then recently destroyed by the heathen, to be rebuilt only in a spiritual sense by the Christians (xvi. ); the Christians to be the true heirs of the covenant (xiii. ); the whole atonement rite—especially the scapegoat, driven away amid curses and pulling off of hair, and with the scarlet rope about its neck—to be a type of suffering Jesus (vii. ); likewise the Red Heifer, the ashes of which were taken up by boys, who sprinkled the people with them for purification (viii. ; compare Parah iii. 3). Circumcision was not to be of the flesh, which was but a delusion of the devil, but of the heart; even Abraham's circumcision of the 318 men of his household (Gen. xvii. 27; compare with xiv. 14) referring, by a Gematria of the Greek alphabet, to Jesus and the cross ("Epist. of Barnabas," ix.). The "clean" and "unclean meat" was likewise to be taken allegorically only. On the other hand, the writer finds the baptismal water and the Christian cross prefigured in the Old Testament (ib. xi. and xii. )—the latter particularly in the bronze serpent, and Jesus in Joshua the son of Nun (xii.). The Tables of the Law given by Moses having been broken by him, the testament was to be received anew from the hands of Jesus (xiv. ); and the Sabbath of Creation points to the millennium after six thousand years, when all life shall have been sanctified by the Messianic advent, whereas the Jewish Sabbath and holidays have been declared to be unacceptable. The second part of the "Epistle," corresponding (except in some Christian details) with the Didache, a Jewish manual of instruction for proselytes (or a Jewish-Christian manual of conduct), betrays an altogether different spirit, and was probably attached to it by some copyist at a much later time. As pointed out by Güdemann ("Zur Erklärung des Barnabasbriefes" in his "Religionsgeschichtliche Studien," 1876, pp. 109-131), the writer seems to have been a converted Jew whose fanatic zeal rendered him a bitter opponent of Judaism within the christian Church. Brüll, Jahrbücher, iii. 179, 211.